Jankovic & Shvedova complete the final 8 in Paris. 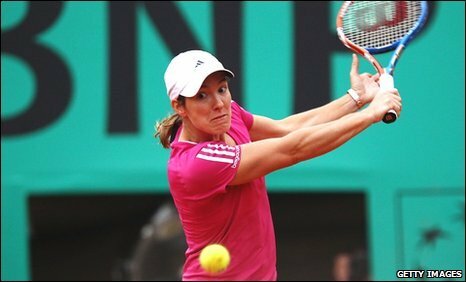 Jelena Jankovic eased past Slovakia’s Daniela Hantuchova 6-4 6-2 to reach the quarter-finals of the French Open on Monday. Jankovic, a semi-finalist in Paris in 2007 and 2008, was rarely troubled by the 23rd seed during her one-hour and 25-minute stroll on Centre Court. The former world number one, looking to clinch her maiden grand slam tournament, wrapped up the win on her first match point when Hantuchova misfired a service return. Jankovic will next Yaroslava Shvedova who defeated the ‘other’ Aussie Jarmila Groth in straight sets 6-4,6-3. Shvedova who’s currently ranked #36 has played Jankovic 3 times on hard courts, and Jankovic holds a 2-1 edge. 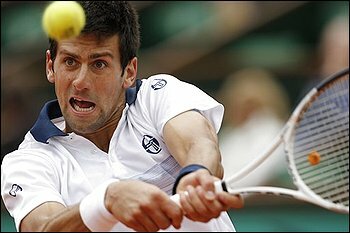 Djokovic, Nadal, Almagro & Melzer into final 8. Rafael Nadal moved a step closer to reclaiming his French Open title with a 6-2 7-5 6-4 win over rising Brazilian star Thomaz Bellucci. Bellucci, 22, broke the world number two’s serve four times but could not find the consistency to mount a serious challenge against the Spaniard. Nadal will face compatriot Nicolas Almagro, who defeated another Spaniard, Fernando Verdasco, in the last eight. Novak Djokovic earlier booked a quarter-final against Jurgen Melzer. Djokovic, the third seed, overcame a sloppy second set to beat unseeded American Robby Ginepri 6-4 2-6 6-1 6-2 while Melzer ended the run of Russian qualifier Teimuraz Gabashvili with a 7-6 (8-6) 4-6 6-1 6-4 win. Almagro saw off a jaded Verdasco 6-1 4-6 6-1 6-4 in two hours and 12 minutes in the last men’s match of the day. In beating Bellucci, Nadal went one step further at Roland Garros than he managed last year when he was stunned by Robin Soderling in the last 16, his first ever defeat in five visits. Austria’s Jurgen Melzer booked his place in the French Open quarter-finals after ending the remarkable run of Russian qualifier Teimuraz Gabashvili. The 22nd seed claimed a hard-fought 7-6 (8/6) 4-6 6-1 6-4 victory on Suzanne Lenglen Court and will next face Novak Djokovic. World number 114 Gabashvili had not dropped a set en route to the last 16 and completed an embarrassingly one-sided third-round win over Andy Roddick on Saturday. But despite producing another flurry of winners, he made almost as many unforced errors as the experienced Melzer held sway. 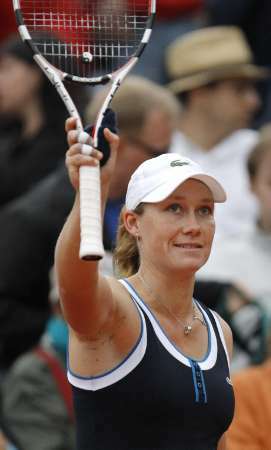 Aussie, Aussie, Aussie echos around Roland Garros as Henin is defeated by Stosur! Samantha Stosur took off her sunglasses to begin the second set, after a terrible nervous beginning, and commenced to play like a champion. She defeated the 4 time champion Justine Henin 2-6, 6-1, 6-4, and moves on to meet Serena Williams. The sun was not shining at the start of the match, and it was hard to understand why she wearing her Oakleys. She was nervous and could hardly manage to win a point on her own service. The second set, sans glasses, was a different story as she hit forehand winner after forehand winner to hand Henin her worse single set defeat in a long long time. Stosur’s second serve, where she won 60% of the points, was the key to the match. Henin at just 5’5″ was forced to play the high kicking service up around her ears, and as talented as she is, she could not return the ball with any authority. The 16-year-old, who won the ­junior girls’ Wimbledon title in 2008, claims she prefers turning in early to wild nights out, dislikes drinking and hates smoking. But she said of her fellow players were not so virtuous. The British player said she goes to bed early after training at the Mouratoglou Tennis Academy in Paris. She said: “We’re tucked in by 10pm. My coach knows I’m sensible. I don’t like the taste of alcohol and I hate smoke. Some go to nightclubs, but I’m not interested. She insisted there is no in-fighting among female competitors, whom she called ‘unbelievably strong women’. While adhering to her strict regime, she relaxes with her best friend, Canadian player Eugenie ­Bouchard. She has a video stored in her Blackberry of them dancing in their underwear to a Miley Cyrus song, with Adidas pants on their heads. Another prized Blackberry picture is of her with her “date” Andy Murray – then newly single – at the end-of-tournament dinner for the Australian Hopman Cup in which they reached the doubles final in January. Murray dissappoints again with a lack-lustre performance. Andy Murray’s campaign at the French Open ended on a darkening Court Suzanne Lenglen after he was totally outplayed by 15th seed Tomas Berdych. The Czech player faced just one break point in the match as he ran out a 6-4 7-5 6-3 winner in two hours and 16 minutes to set up a quarter-final against Russia’s Mikhail Youzhny. 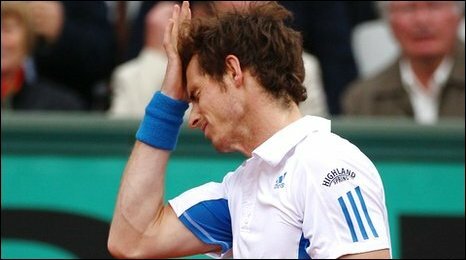 It is only the second time he has made the last eight of a Grand Slam and he denies Murray the opportunity to at least match last year’s run to the quarter-finals. The encounter was scheduled as the fourth and last match on Court Suzanne Lenglen and when the rain arrived with the Czech leading 6-4 3-4 at 8pm local time, it seemed that would be it for the day. But the weather cleared sufficiently for another 50 minutes of play and things went from bad to worse for fourth seed Murray as he dropped serve again to fall two sets behind, before two breaks in the third set brought a swift conclusion. It was the third time in seven days that Murray had played on Roland Garros’s second show court and, after the five-set win over Richard Gasquet and a four-set defeat of Marcos Baghdatis, he found himself up against an even tougher opponent. Berdych has an uncomplicated game based around a strong serve, heavy, flat groundstrokes and attacking anything short, and this straightforward approach was too much for Murray. The Scot faced break points in four of his five service games in the first set, reserving his best moments for rescuing himself, but serving at 49% he was giving Berdych too many chances to tee off with big returns and then dominate from the forecourt. Berdych’s conversion rate on the break points was poor but, facing little or no pressure on his own serve, he needed to take just one and did so when Murray netted a limp backhand in game eight. Federer, Soderling and Youzhny advance to quarters. Roger Federer came through a mid-match wobble to wrap up a straight-sets win over Stanislas Wawrinka and move into the French Open quarter-finals on Sunday. Defending champion Federer made his most convincing start of the tournament so far but also went close to dropping a set for the first time before sealing a 6-3 7-6 (7/5) 6-2 victory in one hour and 56 minutes on a windy Philippe Chatrier Court. 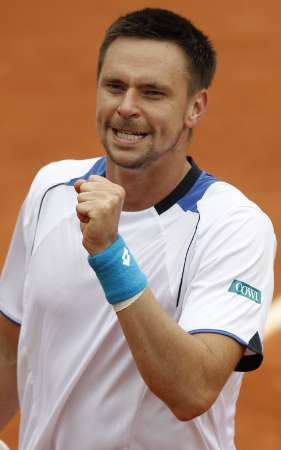 Swede Robin Soderling dismissed Croatia’s Marin Cilic 6-4 6-4 6-2 in the fourth round of the French Open on Sunday to set up a mouthwatering rematch of last year’s final with holder Roger Federer. The fifth-seeded Soderling, who last year handed Rafael Nadal his only defeat at Roland Garros, perfectly read the Croatian 10th seed’s service, breaking seven times. He managed to keep his cool in the key moments of the match as Cilic, who has never made it past the fourth round here, struggled to match the Swede’s brutal strokes from the back of the court. Soderling was in no mood to stay too long on Court Suzanne Lenglen as he ended Cilic’s ordeal after one hour and 40 minutes when the Croatian sent a forehand long. Local hope Jo-Wilfried Tsonga retired injured from his French Open fourth-round match against Russian Mikhail Youzhny on Sunday. Tsonga, the eighth seed, received treatment to his leg when trailing 5-2 in the opening set and called it a day when Youzhny, the 11th seed, won the following game. Tsonga spoke to the chair umpire, flung his racket onto his chair and offered Youzhny his hand. The former Australian Open finalist was the only Frenchman left in the draw at Roland Garros. Venus Williams is ousted by Nadia Petrova in straight sets. Nadia Petrova outserved Venus Williams to defeat the #2 player 6-4, 6-3. It was her first victory over Venus and comes just 2 weeks after she recorded her first victory over Serena in Madrid. Venus looked bewildered throughout her match, served 8 double faults and refused to move behind the baseline to return the hard serves of Petrova. It was rare for a rally to go beyond 4 strokes, which played directly into Petrova’s game plan. Elena Dementieva delivered a routine performance to see off the challenge of South African qualifier Chanelle Scheepers 6-1 6-3. The fifth seed took only one hour and 14 minutes to conclude matters on the showcase Philippe Chatrier court. Dementieva’s victory takes her through to a quarter-final meeting with fellow Russian Nadia Petrova. Italy’s Francesca Schiavone joined Dementieva in the last eight with a 6-4 6-4 win over Russia’s Maria Kirilenko. World number 131 Scheepers had beaten Gisela Dulko, a player ranked 86 places above her, previously in her campaign as she became the first South African to reach the last 16 since Amanda Coetzer in 1997. The 26-year-old may have been given hope of a higher-profile scalp as Denmentieva battled through a calf injury in her win over Aleksandra Wozniak in the previous round. Henin wins, but is she sharp enough to win her fifth French title? Justine Henin fought off a resurgent Maria Sharapova to reach the fourth round and stay on course for a fifth French Open title. It was Sharapova who took control of the 3rd set going up 2-0 and with 3 game points for a 3-0 edge, but failed to convert. This was the best match that Maria has played since her long lay-off, and it must put her among the favourites going into Wimbledon next month. The Belgian took the final set when the match resumed on Sunday to win 6-2 3-6 6-3 after play had stopped the previous night with the score at one set all. It takes the 22nd seed through to a fourth-round meeting with Australia’s Sam Stosur and keeps alive her unbeaten six-year stretch at Roland Garros, which includes the last two years when the former world number one did not play because she was in retirement. Having reached the final of the Australian Open in January, a matter of weeks after ending that 20-month spell out of the game, the four-time French Open champion was widely expected to pick up where she had left off at Roland Garros in 2007, where she completed a hat-trick of wins. And the 27-year-old had made the better start in cold, damp conditions on Saturday evening, with victory in sight when she led by a set and 3-3, 15-40. But Sharapova, 23, had been more than holding her own and saw off the danger before finally getting the better of the Henin serve in the next game, having already seen seven break points slip by. Djokovic and Nadal move into the final 16. 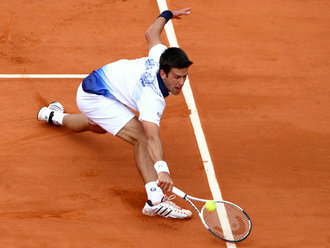 Third seed Novak Djokovic was made to fight his way into the last 16 of the French Open by Romanian Victor Hanescu. In a seesaw performance that saw Djokovic hit eight double faults and 25 unforced errors, the Serbian pumped his fists and smashed his racket onto the ground as he struggled to break Hanescu’s resistance. The 23-year-old right-hander came back from a break down in the fourth set to sweep six games in a row, wrapping up a a 6-3 3-6 6-3 6-2 win when Hanescu misfired a service return after two hours and 38 minutes. 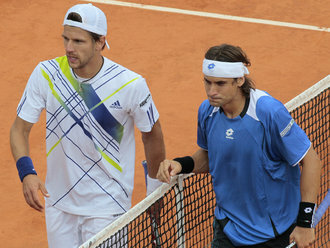 The 2008 Australian Open will meet either Juan Carlos Ferrero or Robby Ginepri in the fourth round. Rafael Nadal shook off dogged resistance from Lleyton Hewitt to ease into the fourth round of the French Open. Four-time champion Nadal showed glimpses of his mastery of clay despite once again not being at his very best on a soggy Philippe Chatrier Court. And the second seed dominated more than enough of the pressure points to seal a 6-3 6-4 6-3 in two hours 28 minutes and set up a last-16 clash with 24th seed Thomaz Bellucci. This match was the fourth time Nadal and Hewitt had met at Roland Garros and the fifth time on clay – the Spaniard winning them all, including at the same stage in Paris last year. Despite claiming to have made a slow start to his quest for a fifth French Open title, Nadal had lost only 13 games en route to round three – fewer than any other year. He was caught cold by a fast start from Hewitt, dropping his serve in the opening game. But he then reeled off the next four games thanks to a combination of his own brilliance and slack play from the Australian 28th seed. Nadal will face Thomaz Bellucci in the fourth round after the Brazilian upset 14th seed Ivan Ljubicic in straight sets.